Availability: Usually ships in 24 hrs. More camber adjustment than stock, caster adjustment, aircraft bearings, and engraved with calibrated degrees. Every component is anodized or plated, including fasteners. Adds extra travel to avoid excessive bottoming out, this is a very well engineered product. Camber and caster are separately adjustable by sliding the mounts, without removing any components from the car. The priority of this design is to allow fast, repeatable alignment changes at the track. 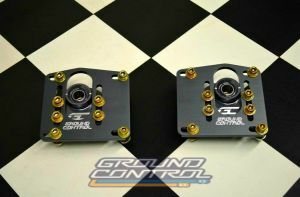 The Ground Control camber plates feature two sets of bearings, a proprietary bearing, made to our specs by Aurora in the USA, which allows for articulation of the shock shaft. This spherical bearing is very understressed, as the Ground Control design does NOT support the weight of the car on the spherical bearing. Instead, the weight of the car is supported by a completely separate articulating needle bearing, which is also manufactured for Ground Control in the USA. All Ground Control products carry a lifetime guarantee against defects when installed and maintained correctly. We strongly recommend that all of our products be installed by a competent, qualified mechanic. 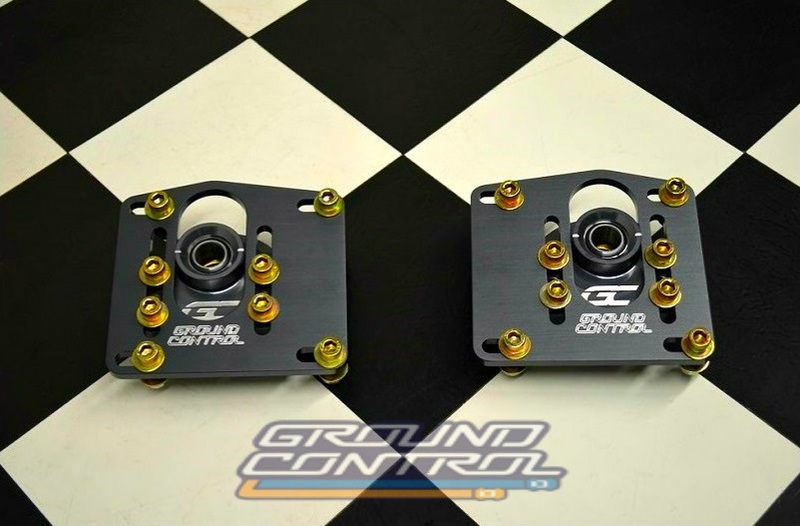 "Ground Control" is a registered trademark of Ground Control Systems Inc.
your official source for the best in suspension systems.